Summer is at its peak and is wreaking havoc but it will be soon over. Most of us are eagerly waiting for the time of year. But as we slip into fall, we will see pumpkins. Most of us probably hate pumpkins as a food but they are kind of fun. The creepy evil-faced Halloween smileys have some kind of attraction to them. Not to mention some (we mean just a handful) people just happen to love pumpkins. Pumpkin cheese cakes, pumpkin ravioli, pumpkin candles – they just happen to be crazy about pumpkins. But how beneficial is a pumpkin from health aspect? Studies reveal that while pumpkins are greatly beneficial for health, their seeds are also capable of doing wonders. Pumpkin seeds are known to offer a wide range of benefits including some serious stuff like controlling cholesterol, preventing osteoporosis, improving immune system, fighting depression, improving bladder function, improving conditions of learning disorders and more. When it comes to hair care and skin care, pumpkin seeds are kind of super effective. They help to cure baldness by stimulating hair growth. They aid with the formation of collagen and skin cells, thereby rejuvenating skin. They help to maintain healthy scalp and helps to strengthen hair. But the question is, how to use pumpkin seeds for hair loss prevention and skin care? Toast the pumpkin seeds and convert them into tasty snack. Heat the seeds at 300°C for an hour to dry them out properly. Add a tablespoon of cumin and olive oil to the seeds. Add garlic powder, red pepper and cardamom and cook for as long as it takes to toast them properly. Allow them to cool and eat! Store for later use. 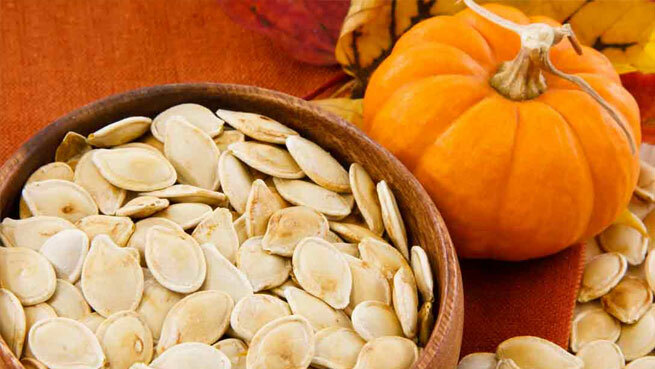 If eating isn’t what you prefer, you can always use the pumpkin seeds externally for preventing hair loss. However, you need to know that using the seeds whole is not really a method. In fact, you really cannot use the seeds on their own externally. You need to extract the oil from the seeds. If you have means to do so, it is good but if you don’t know how to extract the oil, just hit the market and buy some organic pumpkin seed oil. Cut an apple into half and take one half and puree it or blend it. Add a tablespoon of the oil and shea butter to the apple puree. Whisk the egg in a separate container. Add the egg to the mixture of apple puree, shea butter and pumpkin seed oil while constantly stirring it. Your conditioner is ready for use! Wash off your hair properly using shampoo and then apply the conditioner to your hair and scalp. Leave it for 20 to 30 minutes and then rinse off. Use a shower cap if necessary while waiting for 30 minutes. Using this homemade conditioner will help to reverse balding, prevent hair thinning and make the locks shiny and smooth. You will be enjoying these benefits because of vitamins A, B (biotin) and K as well as sulfur and zinc present in pumpkin seed oil. Of course shea butter, egg and apple also have benefits to offer! As before, save yourself some trouble and get the pumpkin seed oil. You can use the oil to make toner and also use it as a face cleanser. But how? Here is how you need to proceed. Toner: Just get hold of your preferred cosmetic toner and add pumpkin seed oil to it and apply on your skin. As far as proportions are concerned, use in equal proportions if you have normal skin. In case of dry skin, increase the oil content and in case of oily skin, add less oil to the toner. Exact proportions cannot be mentioned because you need to figure out the best proportion as per your skin’s needs. Nutmeg: this is known for its anti-inflammatory features and ability to cure acne scars. It is also known for preventing pimples. Raw honey: this one helps to cure acne, eczema, hyperpigmentation, rosacea and even helps to maintain pH balance of skin. Tea tree oil: this is actually optional but adding this component will help if you have oily skin. If you have dry skin, you can skip this. Raw honey – ½ cup. Pumpkin seed oil – 1 tablespoon. Tea tree oil – just a few drop (again, this one is optional). Do you have other pumpkin seed recipes in mind for hair loss prevention and skin care? Feel free to share with us. Also Read – How to Prevent Hair Loss After Pregnancy? Sankalan specializes in health and nutrition. He is an avid reader of recent medical researches and loves to explore the hidden treasures of nature and share his knowledge with others.